" We get a lot of public complaints related to traffic jam on Jalan Ampera Raya"
South Jakarta Transportation Sub-dept. is applying traffic engineering trial at Jalan Ampera Raya in a bid to parse traffic jam in the morning and afternoon. According to Christianto, Head of South Jakarta Transportation Sub-dept., it is done to follow up the report of the locals. "We get a lot of public complaints related to traffic jam on Jalan Ampera Raya through CRM application. So we are testing traffic engineering today," he expressed, Tuesday (12/11). 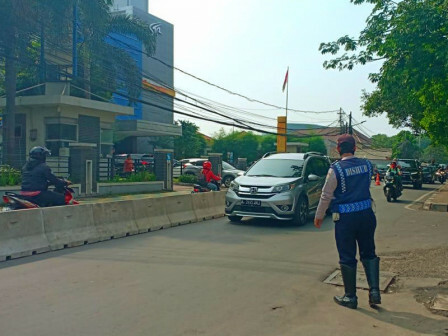 It is done by placing a movable concrete barrier (MCB) on the middle of Jalan Ampera Raya, precisely in front of Jalan Kenangan and Gg Kancil. It will direct every motorist that goes out from two roads do not cross the lane. "So motorists coming from Jalan Kenangan to TB Simatupang will be rerouted to Kemang-in front of Circle. Then those who come from Gg Kancil towards Kemang will be rerouted to Omah Restaurant," he explained.